The fog comes in, and a drop of water forms on a pine needle, rolls down the needle, and falls to the forest floor. The process is repeated over and over, on each pine needle of every tree in a forest of Bishop pines on Santa Cruz Island, off the coast of Santa Barbara. That fog drip helps the entire forest ecosystem stay alive. Thousands of years ago, in cooler and wetter times, Bishop pine trees are thought to have proliferated along the West Coast of the U.S. and Mexico. Now, stratus clouds –– the low-altitude clouds known locally as "June gloom"—help keep the trees growing on Santa Cruz Island, Santa Rosa Island, and on one island off Baja California. Other than these locations, Bishop pine trees grow only farther north in California where it is cooler and wetter. 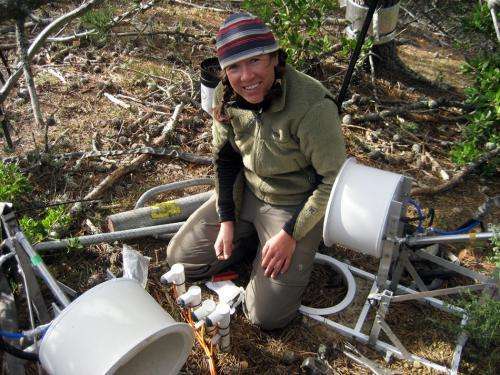 Mariah S. Carbone, first author of a new paper, titled "Cloud Shading and Fog Drip Influence the Metabolism of a Coastal Pine Ecosystem," and her co-authors, studied the influence of clouds on the largest Bishop pine forest of Santa Cruz Island. Carbone is a postdoctoral fellow with UC Santa Barbara's National Center for Ecological Analysis and Synthesis (NCEAS). Their study was published in the journal Global Change Biology. "When people think about climate change, they're often thinking about temperature and precipitation," said Carbone. "When you think about precipitation, it's rain and snow, depending on where you are. What this study showed is that you can have really important water inputs coming from clouds that influence the carbon cycle." She explained that clouds are one of the largest uncertainties in global climate, and that the forest ecosystem interactions with clouds have a large impact—one that has rarely been studied before, particularly in Southern California. Changes in cloudiness or cloud height with global warming will alter the types of forest ecosystems that grow in coastal California, explained Carbone. While predictions about how rainfall will change in California over the next 50 years are uncertain, fog and low-stratus clouds might decline as sea-surface temperatures warm. Like the relict Bishop pines on Santa Cruz Island, and the majestic coastal Redwood forests in Northern California, forests remove and store carbon from the atmosphere, and thus are important for understanding greenhouse gas concentrations in the future. These coastal forests are also highly valued for their aesthetic and recreation qualities. Fog is often present in coastal California during May through August. It occurs when the land warms in the spring and summer, and moist ocean air is pulled over cold, upwelling coastal waters. This moist air then condenses under a stable atmospheric inversion layer, creating low clouds or fog banks. "The finding that summer fog strongly impacts carbon cycling highlights the need for improved understanding of whether we should expect coastal summer cloud behavior to change in a warmer world," said second author A. Park Williams, a former graduate student in UCSB's Geography Department, now at Los Alamos National Laboratory. "A change in summer fogginess could produce temperature, moisture, and carbon feedbacks in coastal ecosystems that easily swamp out the effects expected from increased greenhouse gases alone," said Williams. The carbon cycle involves the movement of billions of tons of carbon between the oceans, lands, and atmosphere every year. Increased amounts of carbon dioxide, a potent greenhouse gas, —are injected into the atmosphere and contribute to climate change. The scientists received help from NASA and NOAA in collecting information. "We used satellite data to map the spatial distribution of cloud cover across the western portion of Santa Cruz Island," said senior author Christopher J. Still, formerly an associate professor at UC Santa Barbara, now at Oregon State University. "We had some evidence of a cloud cover gradient from the coast to inland, based on our own observations and our weather station data, but the satellite data –– from NOAA and NASA satellites –– really allowed us to quantify this gradient across the western half of the island and in particular at our two study sites," said Still. Still said that the authors believe this study is unique in linking clouds to soil microbial activity. "While most previous research on fog and ecosystems has focused on its role in plant-water relations—such as the well-known linkages between fog and coast Redwoods—we show that soil microbial activity and metabolism in these coastal ecosystems may be very dependent on the light but frequent fog drip that occurs during the rainless summer months," said Still. The study is also unique in linking fog and low clouds to the carbon cycle of a coastal ecosystem, including its impact on tree growth and soil respiration. "What we found was that there are two major effects of the clouds," said Carbone. "One is shading, which keeps the temperatures cooler and the soil moisture higher. The other is fog drip, which is a water input into the soil." The soil moisture content was not depleted as rapidly where the trees were under more cloud cover, and thus they were able to grow longer into the dry season. 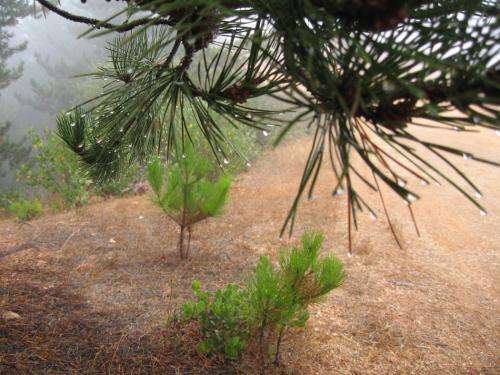 Water pulses from fog drip immediately stimulated microbes in the litter and soil below, but did not directly enhance pine tree activity. The microbial activity releases carbon dioxide into the atmosphere. "This study provides us with a greater understanding of how fog and the low coastal clouds which Californians commonly call 'the marine layer' affect plant growth and the activities of microorganisms in the soil," said John Randall, scientist with The Nature Conservancy, which owns and operates Santa Cruz Island in cooperation with the National Park Service and the University of California. 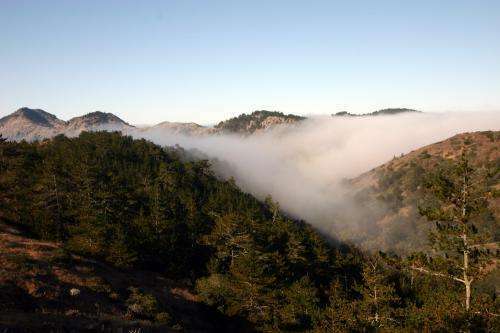 "Their findings of the importance of fog and low clouds in influencing plant growth and survival and microbial metabolism in the soil will help us understand how changes in coastal fogs and low clouds that may accompany climate change will affect the forests and soils on Santa Cruz Island, other islands off the coast of California and Mexico, and all along the coast of the adjacent mainland." How does climate change affect ferns and fog on the forest floor?